Indexes fell nearly 2% today, but these two retailers posted huge stock price gains. 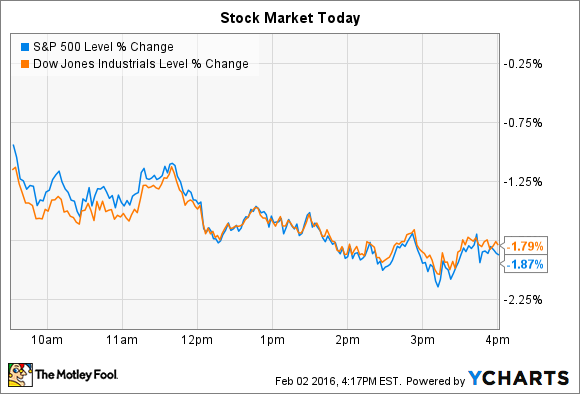 Slumping oil prices helped push stocks significantly lower today. The Dow Jones Industrial Average (DJINDICES:^DJI) lost 295 points, or 1.8%, and the S&P 500 (SNPINDEX:^GSPC) shed 36 points, or 1.9%. But two retailing stocks bucked that strong down trend today. In their fourth-quarter earnings reports published before the opening bell, Michael Kors (NYSE:CPRI) and Mattel (NASDAQ:MAT) both gave investors reason to believe in an operating turnaround after a long string of disappointing results. Luxury retailer Michael Kors surged 24% higher after posting surprisingly strong fourth-quarter results, yet the spike still left long-term shareholders down nearly 50% from the all-time high they saw in early 2014. For the critical holiday shopping season, the retailer's revenue and earnings growth beat management's expectations. Comparable-store sales fell by 1%, which translates into a 2% gain after accounting for foreign currency swings. That was a solid improvement over the prior quarter's 3% comps drop. Michael Kors turned in a mixed profitability performance as pricing markdowns offset gains in its licensing business. Overall, gross profit margin fell by less than 1% on a currency neutral basis, to 60% of sales. For the quarter ahead, management forecast minor comps gains as sales are expected to come in at $1.14 billion at the midpoint of guidance and EPS to settle between $0.93 and $0.97. While both of those figures were below consensus estimates, CEO John Idol noted that the recent growth trends are improving into the current quarter. "We are on track to deliver solid financial performance in the fourth quarter," he said in a conference call, "as comps continue to show sequential improvement and we capture additional market share in the luxury fashion accessories category globally ." Mattel's stock jumped 14% higher after the toys and games maker beat analysts' fourth-quarter estimates. Profit figures edged consensus targets as earnings improved to $0.63 per share compared to the $0.61 analysts had forecast. The company succeeded in returning to growth in its flagship Barbie business over the holidays, which slumped by double-digits in 2014. Meanwhile, big gains in the Hot Wheels and Fisher Price franchises contributed to Mattel posting slight quarterly sales growth, rather than the drop that Wall Street was bracing for. "We achieved our goal of stabilizing the business," CEO Chris Sinclair said in a conference call . The company didn't have to sacrifice profitability to achieve those revenue gains, either. Instead, cost cuts powered a huge expansion on the profit side. Operating income improved to 15% of sales, up from 12% a year ago and Mattel's bottom line profits strengthened as net income jumped to 11% of sales from 7.5 %. Looking ahead, the company still faces the massive challenge of replacing the Disney Princess business it lost to competitor Hasbro. Its American Girl product line isn't performing up to plan, either. But management believes that overall sales won't shrink in 2016, and earnings should continue to benefit from the kind of expense discipline that boosted profits this quarter. Altogether, that was enough evidence of a turnaround to excite investors today.